In 2015, Blake Bortles finished as the No. 4 fantasy quarterback. He led the league in passing yards on deep passing (passes 20-plus yards in the air) by more than 150 yards (1,331 for Bortles, 1,180 for Drew Brees in second). He threw for a 106.3 passer rating on those deep balls. Bortles has played four years in the league, so three years other than that 2015. In the other three years combined, Bortles, has thrown for 1,438 yards on deep balls total. He had 10 touchdowns and 4 interceptions on deep balls in 2015; he has 6 and 14, respectively, over the rest of his career. That 106.3 passer rating in 2015 drops to 39.3 the rest of his career. 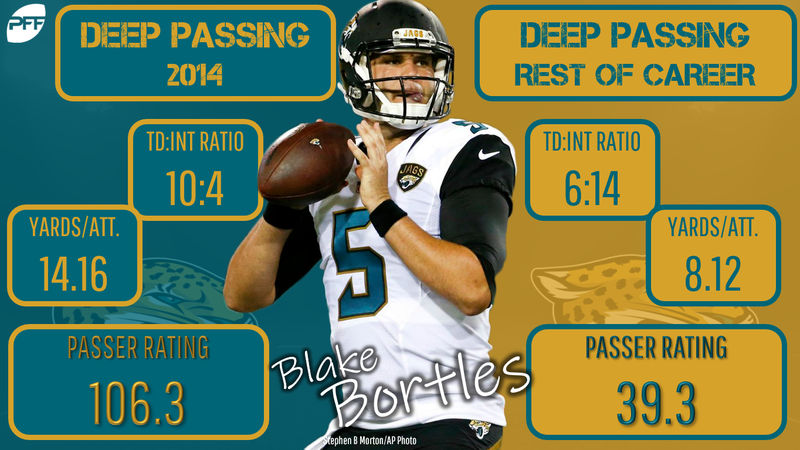 In short, Bortles’ career year coincided with a serious spike in deep-ball performance. On non-deep passes, he has always been more or less the same quarterback, but when he’s throwing the ball a long way, either Bortles is at the top of the league (2015) or waaaayyyyy at the bottom. In recent years, that’s a similar story, if slightly less dramatic than Bortles’ numbers. In the PFF QB Annual, our data guys found that deep-passing ability is not very sticky year-over-year. Some quarterbacks have shown an ability to be an adept deep-ball passer over a career, but there are plenty of outliers that have proven to be wildly unpredictable. It’s tempting to want to credit the existence of Odell Beckham Jr. in the Giants offense for the 2015 performance from Manning, but even just taking his career into account, Manning’s non-2015 deep-ball passer rating is only 53.8. This was just a random year. While Manning’s stable of weapons in 2018 (in addition to Beckham, he has Sterling Shepard and Evan Engram back and adds rookie running back Saquon Barkley) certainly seems promising, the fact that Manning’s deep-ball passer rating hasn’t topped 60.8 since 2012 — 2015 notwithstanding — tells me he’s going to have to get lucky in 2018 to significantly exceed value on his current ADP at QB25. Ryan was very good in 2017. His PFF grade of 88.6 tied Drew Brees for second-best, and it was only a hair shy of his 92.6 MVP season in 2016. That’s as good an illustration of the fluky nature of the deep ball as anything I can think of — Ryan’s deep-ball passer rating fell from 136.1 to 79.0 despite performing at largely the same level, while his passer rating on all other passes fell off to a much lesser degree (108.9 to 93.1). Whereas Manning’s baseline on deep balls is a high-70s passer rating, Ryan has floating in the high 80s for most of his career. That combined with his strong PFF grades are enough reassurance to me that, while we may never see Ryan repeat 2016, his current ADP of QB14 is at least a safe floor. Smith’s career has had so many ups and downs that it might be reasonable to question whether there is any real value to a career-fantasy-finish average, but the truth is that he had never finished higher than 13th prior to 2017, and only once finished higher than 16th. Smith’s virtues as a real-world quarterback are perfectly fair to debate, but for fantasy he had never before been much beyond a bye-week fill-in. Yes, a trio of Tyreek Hill, Travis Kelce, and Kareem Hunt can do a lot toward making a quarterback look more productive, but (a) so can a simple fluky good year, and (b) Smith doesn’t even have those guys in 2018, as he heads to Washington, where the upside of Derrius Guice/Chris Thompson, Jamison Crowder, and Jordan Reed might be a poor man’s version of the Chiefs group, but odds are they are a good bit worse. Smith is a fine quarterback. But he’s currently QB21 in ADP, and that’s a pretty safe spot. There won’t be value there. What does all this mean for fantasy? Sample size has been my pet project lately. Looking at single-year numbers is a good way to get things distorted, to draw conclusions that aren’t real. We can be reasonably sure that Aaron Rodgers is a good deep-ball passer, that Drew Brees isn’t about to fall off a cliff in that regard. But when a quarterback reaches a whole new level on the deep ball this year, whoever it is, view that performance with a heavy dose of skepticism. That’s true of every stat, really. A single year can be a breakout. Without question. Adam Thielen jumped from 144 yards in 2015 to 967 in 2016, and that wasn’t a fluke, as he climbed again to 1,276 in 2017. Sometimes, viewing a breakout with skepticism can be a mistake. But believing in them will be a problem more often. When in doubt, be skeptical. And … don’t believe in Blake Bortles for fantasy.